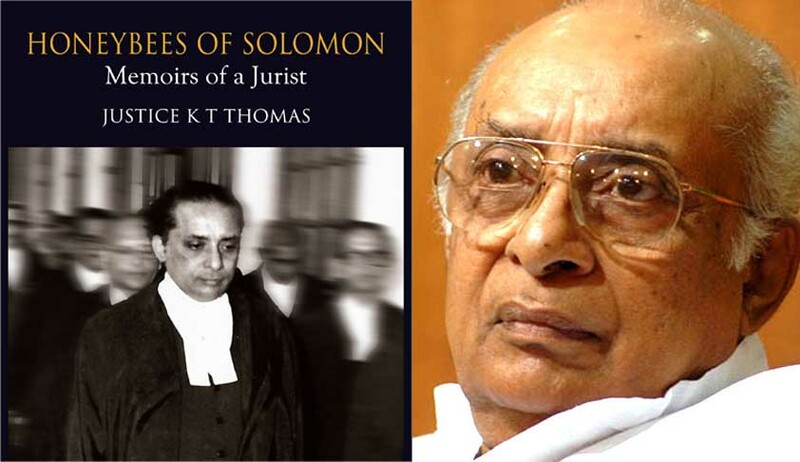 Justice K.T.Thomas was a judge of the Supreme Court of India from March 29, 1996 to January 30, 2002. His memoirs, Honeybees of Solomon: Memoirs of a Jurist, first published in 2008, has been republished recently, by Universal Law Publishing, an imprint of LexisNexis. In it, Justice Thomas, not only discusses his early influences in his life, but also traces his evolution from the bar to the bench. Justice Thomas also discusses the rationale of some of the landmark judgments, delivered by him, or by the bench which he was part of. Divided in 18 chapters, his memoirs is an important contribution to the autobiography of Indian Judges, about whom there is not enough literature, as most of them choose to be reticent, both during and after their judicial career. A budding lawyer would find several tips to become successful in the profession. A student of law would find several pages insightful to understand the development of law. A historian would find it a minefield to pursue further research into areas, hitherto unexplored. Those who are curious about his memoirs’ intriguing title, may well read xv-xvi, titled, The Raison D’etre of the Nomenclature. Discerning the real from the fake, the just from the unjust, would require a Judge to look for honeybees, a metaphor, for what Justice Thomas calls, divine guidance, which takes different forms in every case: an answer to a query, a document or a flash through his inner mind. “I was able to distinguish the just from the unjust not on account of any sagacity of my own or the function of my cognitive faculty, but by the guidance through such honeybees”, reveals Justice Thomas in his memoirs. A reader is sure to find a few nuggets worth mentioning here: Justice Thomas steadfastly resisted meeting the Collegium members of the Supreme Court, before his elevation, despite being persuaded to do so by his well-wishers; Justice Thomas also accepted the first official accommodation at 15, Thuglak Road, New Delhi which was offered to him after joining the Supreme Court, despite its notorious reputation it had that it was ghost-infected, and its occupants suffered one way or the other. In this conversation with LiveLaw, Justice Thomas answers some questions about his memoirs, as well as some of the recent controversies concerning orders and judgments discussed in it. LIVELAW: Among the orders and judgments discussed in your memoirs, the one on the composite floor test, which the bench you were part of, had issued in 1998, in the Jagdambika Pal case, is currently the subject of controversy, following the Tamil Nadu’s political crisis. Do you think, the Governor of Tamil Nadu could have directed the assembly to opt for a composite floor test, with secret ballot, to ascertain the wishes of the MLAs? JUSTICE K.T.THOMAS: The viewers of the TV channels saw ugly scenes in the Tamil Nadu Assembly following the Governor asking Edappadi K.Palaniswami to prove that he has majority support of the members of the Assembly. There was a demand from the Leader of the Opposition in the Assembly as well as from the rival claimant O.Panneerselvam to have secret voting to be held in the Assembly. But the speaker of the Assembly turned down the request. Of course, the Speaker is the authority to decide regarding the modality of the floor test. He has the discretion to choose which modality is appropriate. In my view the Speaker should have taken into consideration the peculiar background in which the demand for secret voting was made by the Opposition Leader and the rival claimant. The Speaker should have exercised the discretion after foreseeing the possibility of a pandemonium erupting inside the Assembly in the event of rejecting the demand for secret voting. As the V.K.Sasikala camp was holding 122 MLAs of the ruling party by herding them in a resort for a long period of days and the fact that whoever came out of the resort had expressed support to Panneerselvam, it is reasonable to think that the real floor test can be had through a secret voting.. Here the Speaker has failed to exercise his discretion in an appropriate manner. I think the substantial viewers of the TV channel did not believe that MLAs had the free and independent will to cast each one’s vote whether in support or against Panneerselvam, unless it was a secret voting. Here, the Governor has the authority to decide who shall be appointed by him as the Chief Minister. But a sagacious Governor while choosing the person will bear in mind two aspects. One is that the person chosen by him must have the confidence of the members of the Legislature. Second is, the person so selected should be able to provide a stable government. Having decided to choose Palaniswami as Chief Minister the Governor has to satisfy himself that the person so chosen has the support of the majority in the Assembly, The Governor could have adopted the precaution that voting in the Assembly should be by secret ballot, in the peculiar background. The question of opting for a composite floor test did not arise in this case as the Governor had already appointed Palaniswami as the Chief Minister and waited for ensuring that he has the support of the majority members of the Assembly. The 1998 episode in UP Assembly had special peculiarities in which the Supreme Court directed a composite voting to be taken through secret ballot. LIVELAW: The order on the composite floor test has been criticized because it does not have the precedential value, and the court would have been helpless, if the legislature chose to disobey it. However, it was indeed used as a precedent in Jharkhand (2005) and Uttarakhand (2016) by the Supreme Court, in different circumstances. Do you think the criticism against the order, that it disturbed the delicate balance of power between the executive and the judiciary, is valid, in retrospect? In your own memoirs, you say that there was no opposition to the proposal at that time. Could you recall whether the implications of the order were discussed among the three Judges of that bench, and by the counsel? JUSTICE K.T.THOMAS You are correct that the Supreme Court would have become helpless if the Speaker had chosen to disobey the direction of the Supreme Court as in 1998. But we the judges of that bench were almost certain that the Speaker of the Assembly would abide by the direction as he too was willing to take such a test. If the Speaker had disobeyed the direction of the Supreme Court, nothing could have been done by the Supreme Court. So what we the judges did was this: Instead of sending a directive we only expressed our wish that the Speaker would accept our suggestion. Fortunately the Speaker had accepted it and acted accordingly. Of course, we, the three judges (the other two being, the then Chief Justice of India, M.M.Punchhi, and Justice S.C.Aggarwal) of the bench had discussed about this request seriously before it was put into the order of the Court. As the Speaker agreed to accept the suggestion, the question whether our order would disturb the balance between executive and the judiciary did not arise at all. LIVELAW: You had dissented from the other two Judges on the review bench of the Supreme Court, when you held that the death sentence of Nalini-one of the convicts in the Rajiv Gandhi assassination case – must be commuted to life imprisonment. The case has taken so long, with the remaining three death row convicts too succeeding in securing commutation of their sentences to life imprisonment. As the question of remission of their sentences by the state Government become a subject of controversy, what, according to you, should be the way out, especially in the light of the Supreme Court’s judgment in Union of India v Sriharan, which held that the State Government does not have the power to remit in cases investigated by the CBI. JUSTICE K.T.THOMAS: The fact that the convicted persons in Rajiv Gandhi assassination case including Nalini are remaining in jail for more than 25 years disturbs my conscience. The demand for remission of the remaining period of sentence is not favourably considered only because the victim was Rajiv Gandhi, former Prime Minister. These persons languishing in jail for such a very long long period were found involved in the conspiracy to assassinate Rajiv Gandhi. I cannot, in this context overlook the previous case in which accused convicted and sentenced to life imprisonment in the case of assassination of Mahatma Gandhi were released after 14 years by the central government headed by no less a person than Jawaharlal Nehru. The assassination of Mahatma Gandhi took place at a time when prison jurisprudence was in a more premature stage, unlike the present period when much more humane attitude is bestowed. So, as one of the judges who convicted the accused in Rajiv Gandhi assassination case, it is my earnest wish that the remission for the remaining period of life should be granted to them at least after 26 years. LIVELAW: Can life imprisonment without remission, be an alternative to death sentence? Would you agree with the Supreme Court’s verdict in Sriharan, which sees nothing wrong in it, if only to avoid death sentences from being imposed? JUSTICE K.T.THOMAS: Personally I am not disposed to agree with any sentence of imprisonment without remission at all. The pivotal objective of any punishment (other than death sentence) should be reformative of the prisoner. Hence if the authorities of the jail, after bestowing such supervision as may be prescribed are satisfied that a prisoner has considerably reformed and that he could be of use to the nation, he must have the benefit of remission. We shall not forget that the provision for remission is included in our Constitution with a very salutary objective. Hence life imprisonment when awarded shall not be tagged with a rider that no remission at all shall be given to the prisoner. It is not only inhuman, but uncivilized mindset. Dignity of the individual is the key stone of the Constitution. LIVELAW: There has been criticism of the Supreme Court Judges accepting post-retirement jobs with the Government, or posts of Governor and taking up arbitration cases. How far do you think this affects the independence of the Judiciary? JUSTICE K.T.THOMAS This has two sides. Supreme Court Judges can be appointed for any post retirement assignment of the government so that his experience, scholarship and wisdom could be utilized for the benefit of the country. But I am of the considered opinion that such assignment can be given only after a cooling period of at least two or three years immediately after retirement. Those who are desirous of an immediate post retirement assignment can have the tendency to hobnob with politicians for such assignment. The aspiration for an immediate assignment is likely to influence his judicial disposition in the final stage of his career. At least the public might entertain a feeling that this judge would have been so influenced. But taking of arbitration cases is a different matter. An arbitral tribunal can be constituted with a judge only after retirement of the judge for the purpose of rendering judicial verdicts in disputes between litigants. There is no possibility of affecting the judicial independence of a retired judge. LIVELAW: Recently, the former CJI, Justice T.S.Thakur, while speaking at his farewell function at the Supreme Court on January 2, underlined the need to review the rule restricting the Supreme Court Judges from practicing, after retirement. A Judge, primarily, is a lawyer, he said. Do you agree with that view? JUSTICE K.T.THOMAS: I am not in favour of permitting any judge to practise after retirement from the Supreme Court of India. But a judge after retirement from the High Court can practise in any other High Court where he never served as a judge. Subject to this rider I endorse the view of the former Chief Justice of India Justice T. S. Thakur. LIVELAW: What is the ideal age when a Judge should be appointed as the Supreme Court Judge? All the recent appointees to the Court are left with the tenure of just three to five years. Don’t you think the idea of elevating only the chief justices of high courts as the Judges of the Supreme Court is an aberration? JUSTICE K.T.THOMAS: The age at which a person can be appointed as judge of the Supreme Court would depend upon various considerations. First, he should have attained the maturity through his practice for judicial service. However, it is advisable that the person recommended for the appointment to the Supreme Court must have at least 5 years more for rendering service in the apex court. LIVELAW: Do you think the retirement age of the High Court Judges must be raised to 65. A Bill to amend the Constitution for this purpose has been pending for long. If it happens, do you think there is a possibility that the rush to become a Supreme Court Judges would decline among the High Court Chief Justices and the Judges? JUSTICE K.T.THOMAS: I am in full agreement with the suggestion that the retirement of the High Court judges should be on a par with the retirement age of the Supreme Court judges. Earlier this difference was provided for giving aspiration to a judge of the High Court to reach the Supreme Court as judge. But now it is seen that there is a scramble to be elevated to the Supreme Court as the High Court judge would get a further extended period of three more years. This desire is creating problems. If retirement age of the High Court judge and the Supreme Court judge is uniform it will considerably lessen the thirst to reach the Supreme Court. But I am of the view that selection to the apex Court should not be confined to Chief Justices of the High Courts. The collegium can improve its methodology by selecting the best from a zone of at least five senior most judges of each High Court. In the long past, the Supreme Court was fortunate in having renowned and eminent judges who did not earlier occupy the seat of Chief Justice of High Court. LIVELAW: Is there scope for reform of the Collegium system of appointing Judges to the Higher Judiciary? Will greater transparency in decision-making help better choices, or will it compromise the credibility of the Judges, who are not found suitable for appointment to the Supreme Court? JUSTICE K.T.THOMAS: The present collegium system itself is the result of a sincere desire to improve its erstwhile systems. But in practice the collegium as is deliberating in the present set up is affected with more drawbacks than the previous systems. At any rate, the present collegium system must be reformed much. LIVELAW. There has been spate of recusals of Judges of the Supreme Court from hearing cases, without stating reasons. How often you have recused as a Judge during your career, and on what grounds? Do you think Judges ought to disclose reasons for recusal? JUSTICE K.T.THOMAS: I have recused from hearing arguments only in rare cases. It is a question of conscience of the incumbent judge to decide himself whether recusal would help delivery of justice without prejudice or bias. It is not necessary to disclose the reason for recusal in any particular case. If a judge chooses to disclose the reason for recusal it may create prejudice in the mind of the colleague judges before whom the case is posted for hearing thereafter. No advantage is gained by disclosing the reason for recusal. On the other hand the disadvantages are many.